First, the hyphen makes it look more like written English, which improves human readability. @brucel Gandallsopp: “Question after question, of course, is “how do I?”. But beneath questions like “how do I make my pages look the same on every platform” and “how can I make my fonts appear identical on the Macintosh and Windows” is an underlying question – “how do I control the user’s browser?” Indeed, the word control turns up with surprising frequency. Underpinning all this is the belief that designers are controllers . @brucel Håkon One quite specific goal of CSS was to not create a programming language. DSSSL was emerging from the SGML world and that scared us. So did the Turing- completeness. In short, you can't tell if a program will terminate or not -- you could end up in endless loops. Therefore we chose a simpler model where you just made declarations. @brucel Why does this conundrum resonate so universally with people who have used CSS? CSS is hard because its properties interact, often in unexpected ways. Because when you set one of them, you're never just setting that one thing. @brucel Inheritance and Cascade We also added [a] fairly complex mechanism to CSS: inheritance and cascading. Inheritance was/is is fairly well understood, it's used in many other computer languages as well. @brucel Introducing Stylable is a CSS preprocessor for styling components with typed CSS. @brucel Introducing Mr. Potato Mr Potato is a (React) component. “A future version of this specification may allow multiple pseudo-elements per selector." since many of them don't fit into the box's tree structure. Therefore we intend to only allow specific combinations--those that are needed for particular use cases. • Optimization - "ruleset shaking"
@brucel “CSS Blocks implements a strict subset of CSS .” This means we've intentionally restricted some of the features you're allowed to use in a Block file to ensure we can optimize your stylesheets as much as possible! @brucel Thank you! Håkon Wium Lie, John Allsopp, @wixeng Stylable team (especially Tom and Lichtash) ! https://pixabay.com/en/potatoes-vegetables-erdfrucht-bio-1585060/ ! https://www.pexels.com/photo/photo-of-eiffel-tower-paris-811715/ ! https://thenounproject.com/icon/38411/ ! https://pixabay.com/en/eiffel-tower-long-exposure-lights-1156146/ No potatoes were harmed during the making of this presentation. View CSS-in-JS: FTW || WTF? on Notist. 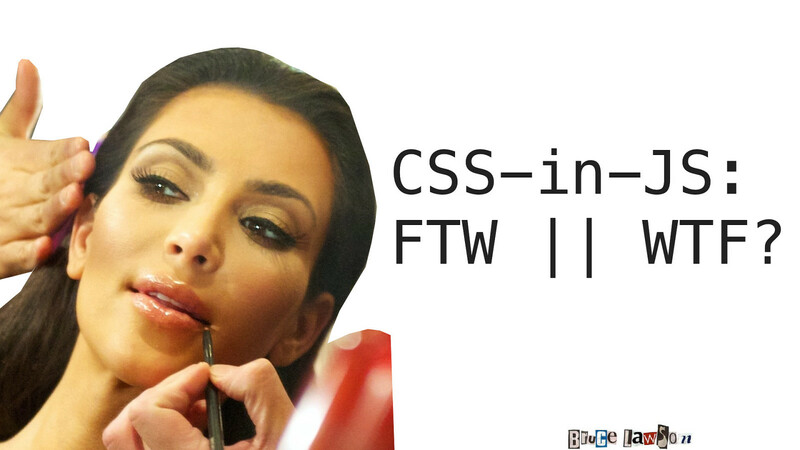 To others, CSS-in-JS is an abomination that makes them want to emulate Kimmie and "release a fragrance" in disdain. Why are scripters so afraid of the cascade? Why the hesitance about inheritance? Let's look at what CSS seems to lack, what the CSS-in-JS libraries can teach us, so we don't do as Kim's buttocks did and "Break the Internet". bruce puts presentations on for free. You can too.